Baked Fish Topped with Fresh Salsa & Served with Roasted Poblano Rice (serves 6) | Crappy Kitchen - Good Dinners! Some of us wanted salad this past Friday, while others craved fish (me!) so my compromise was to make a fish with the feel of something raw and fresh-tasting. This was the perfect solution and gave us all the feeling of warmer days ahead! I think salsa can be added to so many dishes to give it crunch and zestiness. The key is finding good Roma/plum tomatoes, and I was lucky this time around. The other key is cilantro, which I used in abundance! I did not add diced red onion to this salsa (which I normally do) as I was pairing it with fish. Fish and onion: yucky combination I’m afraid. The rice would have been fine on its own but I added some smokey poblano peppers to tie the salsa and rice together and it did wonders for the mild-tasting fish. Try this out next Friday and see if you can’t taste the arrival of Spring! 1 – Put rice on to cook and roast poblano pepper. Wash and dry Poblano and place on a baking sheet. Place close to the grill in the oven and grill until all sides are charred. you will have to check every 3 or so minutes and turn peppers to get the whole thing charred. 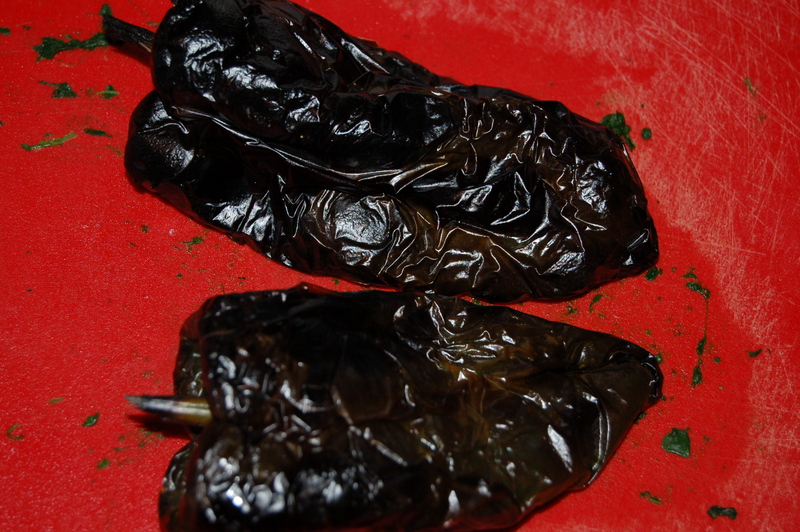 2 – After you char the peppers, place in a brown paper or zip-top bag and close. Let them steam and cool for about 15 minutes. Remove from bag and pull the skin off. It should come off in good-sized stripes. Do not rinse under water as this washes away the flavor. 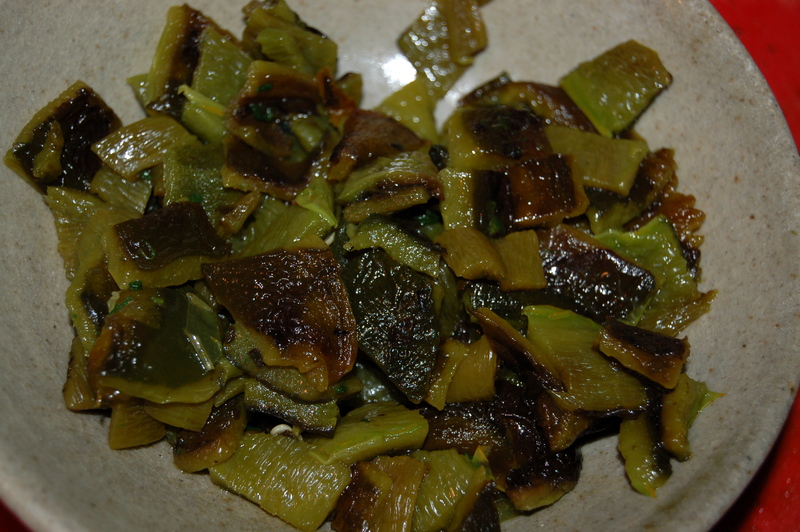 3 – Cut the Poblano in half and remove the seeds by scraping with a knife. Dice peppers. When rice is cooked, mix peppers into rice. Set aside and keep warm. 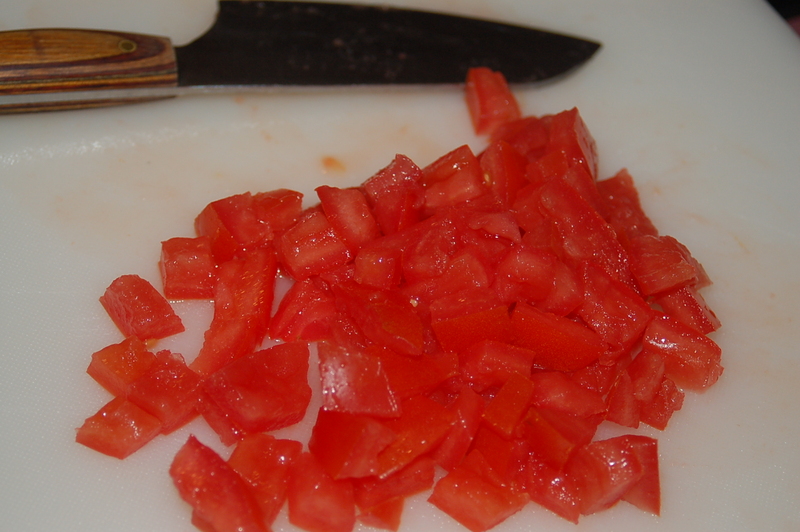 1 – Prepare the tomatoes and place in a bowl, along with the chopped cilantro, minced jalapeno, lime juice and salt. Taste and add more salt and lime juice if you think it needs it. 1 – Put washed and dried fish on large baking sheet in a single layer. Dot with butter and season with some salt and black pepper. 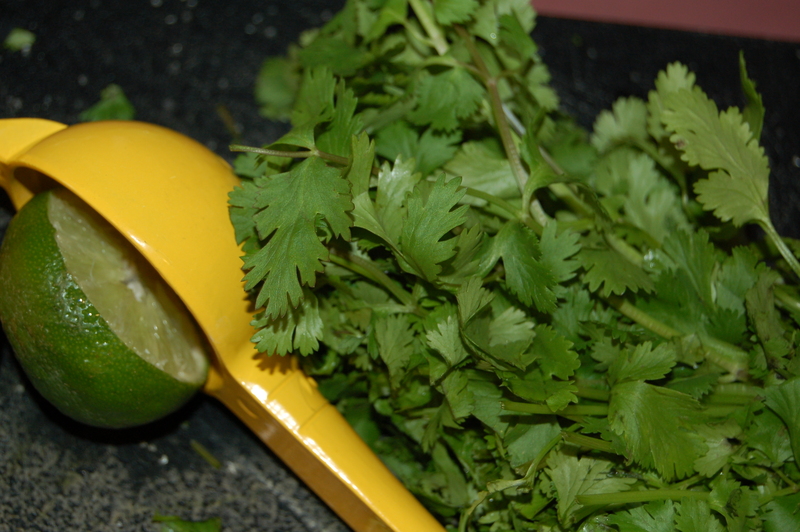 Toss the cilantro leaves over the whole dish and then cover tightly with tin foil. 2 – Place the fish in the oven and bake for about fifteen minutes. Serve fish with some of its juices and a portion of rice topped with a big spoonful of salsa. A little Greek yogurt or sour cream as a garnish is also a nice touch! This entry was posted in "Blood Type A " Recipes, dinners and tagged blood type A, Blood Type A diet, blood type A recipe, cilantro, cod fish, fish and rice, poblano pepper, poblano peppers, red salsa, rice and peppers, salsa, tilapia. Bookmark the permalink.